The control station is used to control the Domain and Exchange rename process. 1. At Ws1, log in as Contoso Domain Administrator. 2. Install "Windows Server 2003 Support Tools". 3. Install "Windows Server 2003 Active Direectory Domain Rename Tools". 4. Install "Group Management Console with Service Pack 1". 5. Install "Microsoft Exchange Server Domain Rename Fixup (XDR-Fixup)". 6. Click "Start", right-click "My Computer", select "Properties". 7. Select "Advanced" tab, click "Environment Variables". 8. Next to "System variables", select "Path", click "Edit". 9. 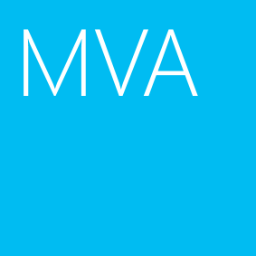 At the end of Variable value, append "C:\Program Files\Microsoft Domain Rename Tools" and "C:\Program Files\exchsvr\Exchange Domain Rename Tool". 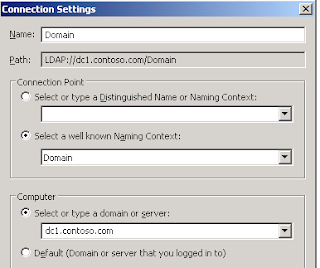 By default, the Primary DNS Suffix of a member computer of an Active Directory domain is configured to change automatically when domain membership of the computer changes. The same default behavior is true when the DNS name of the domain to which a computer is joined changes. Thus, rename of an Active Directory domain can cause modification of the primary DNS suffix and, therefore, of the full DNS host names of the computers that are the members of the renamed domain. 1. Still in Ws1, click "Start > Run", enter "adsiedit.msc". 2. Right-click "ADSI edit', select "Connect to". 3. Next to "Computer", select "Select or type a domain or server", type "dc1.contoso.com". 5. Expand "Domain [DC1.contoso.com] > DC=Contoso,DC=com". 6. Right-click "DC=Contoso,DC=com", select "Properties". 7. On the "Attribute Editor" tab, select "msDS-AllowedDNSSuffixes". 9. Under "﻿Value to add", type "fabrikam.com", click "Add". 12. Click "Start > Run", enter "gpmc.msc". 13. Expand "Forest: Contoso.com > Domains > Contoso.com". 14. Right-click "Contoso.com", select "Create and Link a GPO Here". 15. Type "DNS Suffix rename", click "OK". 16. Right-click "DNS Suffix rename", select "Edit". 17. Expand "Computer Configuration > Administrative Templates > Network > DNS Client". 18. Double-click "Primary DNS Suffix". 19. Select "Enabled", next to "Enter a primary DNS suffix", type "fabrikam.com". 21. Close "Group Policy Object Editor". 22.﻿ Make sure all member computers are received the above group policy. In Part 3, I'm going to perform domain and exchange rename.